Blackburn kept up their chase for a play-off place as Jordan Rhodes's late goal secured victory over Rotherham. Rotherham were dominant after the break and deservedly drew level when Matt Derbyshire poked home Paul Green's low cross. Blackburn manager Gary Bowyer: "It was a massive team effort, we picked up where we left off on Saturday. We saw that in the first half we were totally dominant. "We showed fantastic spirit once we conceded the equaliser. It was fantastic resilience and togetherness from them and we just carried on and carried on. "It was hard fought, but every game in the Championship is. We matched their effort and for long periods of the game we totally controlled." Rotherham manager Steve Evans: "I don't see any reason why in the 33rd minute the referee doesn't give a penalty. It was a blatant handball. We are Rotherham, we don't get them, do we? "We have been on the end of another atrocious decision, but we're used to it. "We're Rotherham so people at the Football League possibly don't want us in the Championship, but we are going to fight to be here. "It's my personal view, but I believe that. I just look at some of the decisions and people say they level out, but if they level out then we have got a lot to come, haven't we?" Match ends, Blackburn Rovers 2, Rotherham United 1. Second Half ends, Blackburn Rovers 2, Rotherham United 1. Attempt missed. Paul Green (Rotherham United) header from the centre of the box is close, but misses to the left. Assisted by Adam Hammill with a cross. Attempt saved. Craig Conway (Blackburn Rovers) left footed shot from outside the box is saved in the centre of the goal. Goal! 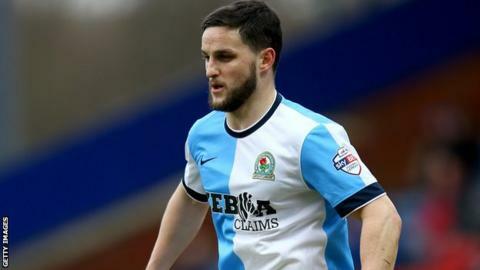 Blackburn Rovers 2, Rotherham United 1. Jordan Rhodes (Blackburn Rovers) right footed shot from very close range to the bottom right corner. Assisted by Rudy Gestede with a headed pass. Rudy Gestede (Blackburn Rovers) hits the left post with a header from the centre of the box. Assisted by Ben Marshall with a cross. Delay in match Frazer Richardson (Rotherham United) because of an injury. Corner, Blackburn Rovers. Conceded by Kári Arnason. Substitution, Blackburn Rovers. Rudy Gestede replaces Chris Brown. Attempt missed. Corry Evans (Blackburn Rovers) right footed shot from outside the box is high and wide to the left. Goal! Blackburn Rovers 1, Rotherham United 1. Matt Derbyshire (Rotherham United) right footed shot from the centre of the box to the top right corner. Assisted by Paul Green with a cross. Attempt saved. Danny Ward (Rotherham United) header from the centre of the box is saved in the top left corner. Assisted by Jack Hunt with a cross. Attempt missed. Ben Marshall (Blackburn Rovers) right footed shot from the right side of the box is high and wide to the left. Assisted by Craig Conway following a fast break. Attempt blocked. Richard Smallwood (Rotherham United) left footed shot from outside the box is blocked. Assisted by Adam Hammill. Offside, Blackburn Rovers. Markus Olsson tries a through ball, but Jordan Rhodes is caught offside. Attempt missed. Corry Evans (Blackburn Rovers) right footed shot from outside the box is close, but misses to the right. Foul by Jay Spearing (Blackburn Rovers). Conor Sammon (Rotherham United) wins a free kick in the attacking half. Substitution, Blackburn Rovers. Ben Marshall replaces Tom Cairney. Attempt saved. Adam Hammill (Rotherham United) right footed shot from outside the box is saved in the top right corner. Corner, Rotherham United. Conceded by Matthew Kilgallon. Attempt missed. Grant Hanley (Blackburn Rovers) header from the centre of the box is high and wide to the right. Assisted by Tom Cairney following a set piece situation.